NOTE: These images are best quality JPEGs straight out of the camera, at default settings including noise reduction and using the camera's actual base ISO (not extended ISO settings). All cameras in this comparison were shot with our very sharp reference lenses. Clicking any crop will take you to a carrier page where you can click once again to access the full resolution image as delivered straight from the camera. For those interested in working with the RAW files involved: click these links to visit each camera's respective sample image thumbnail page: Nikon D750, Nikon D810, Canon 5D Mark III, Fujifilm X-T1, Pentax K3 and Sony A7 -- links to the RAW files appear beneath those for the JPEG images, wherever we have them. And remember, you can always go to our world-renowned Comparometer to compare the Nikon D750 to any camera we've ever tested. Despite the resolution difference here -- 24.3 for D750 and 36.3 for D810 -- both cameras display an impressive level of fine detail at base ISO. Details are very crisp, though not surprisingly the D810 by sheer resolution displays more fine detail. Although slightly different in appearance, both camera display some minor moiré in the red fabric. The Nikon D750 here edges out the Canon in all three crops, though the biggest difference can be seen in the fabric swatches, where the Nikon produces much crisper fine details. 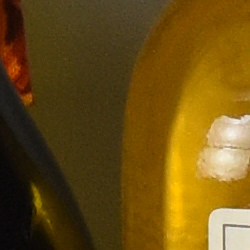 Detail on the bottle surface and the mosaic tile pattern both look just bit crisper and sharper than on the Canon image. Again, here's another comparison with quite a noticeable resolution difference. There's a bit more detail in the bottle crop from the Nikon, however both do very well with natural-looking fine detail in the mosaic. The starkest difference is with the fabric crops. While the X-T1 does an amazing job with the red fabric pattern, the D750 displays more contrast on the red and much more fine detail on the pink fabric. Pentax bumped up the resolution of their flagship APS-C DSLR to 24.3MP with the K-3, and compared to the similarly-spec'd D750, it performs very well and quite similarly in a lot of areas at base ISO. The bottle crops look very similar with sharp detail as does the mosaic crop. Like other cameras, the defining difference is in the fabric. The K-3 handles the red fabric well enough, like the D750, but the color accuracy and some fine detail on the pink fabric is the Pentax's weak spot. The Nikon D750 faces stiff competition against the Sony A7 here at base ISO. The default in-camera JPEG processing of the A7 creates a noticeably sharper image, which is particularly noticeable on the mosaic crop. Overall, both cameras display excellent fine detail (and a little moiré on the red fabric on the Sony, too), and there's not really a clear "winner" with this comparison. Both cameras here do exceptionally well at ISO 1600. There's very little noise from both cameras. Grain is a little more noticeable from the D810, but that's due to the larger resolution. Fine detail, overall, is very good from the D750 at this ISO, though the red fabric's leaf pattern looks ever so slightly better from the D810 (if you look past the moiré-induced "striped" look of the fabric). At ISO 1600, ISO noise in shadows is less evident in the 5D Mark III bottle crop, however, the fine detail in the mosaic looks a bit more natural in the D750 crop. The fabric crops, again, display the biggest difference. The D750 struggles more with the leaf pattern in the red fabric more so than the 5D Mk III, however the Canon struggles more than the Nikon does with the pink fabric. The APS-C-sensored Fujifilm is able to hold its own very well against the full-frame Nikon here at ISO 1600. Noise is well-controlled from both cameras (though, indeed, slightly lower in the Nikon). Differences in fine detail is a little difficult to call, given the big resolution difference, though both cameras are stellar performers at this ISO sensitivity. As for the fabric, the Fuji is clear winner for the red fabric, though it struggle more than the Nikon at the pink. At ISO 1600, we can see the advantage that a full-frame sensor can have at higher ISOs. The Nikon D750 displays less noise, more fine detail and handles our notoriously difficult fabric swatches much better than the Pentax K-3. While the A7 appears to display less noise than the D750 at ISO 1600, it also shows more evident noise reduction processing at its default setting. 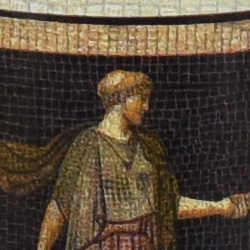 The NR processing of the Sony affects the fine detail in places like the mosaic and fabric swatches, while the Nikon's ISO 1600 image looks much more natural. Today's ISO 3,200 is yesterday's ISO 1,600, so below are the same crops at ISO 3,200. Like the previous comparisons of these cameras, both here at ISO 3200 are again very similar -- and similarly very good -- despite the resolution disparity. Noise is very low from both cameras at default NR strength, and fine detail is still very crisp with only minor degradation from NR processing. The D810 is still able to produce a slightly better leaf pattern on the red fabric and handles the pink fabric a bit better as well. Another mixed comparison here at ISO 3200. The Canon 5D Mark III shows slightly less noise in the shadows than the Nikon D750, while the Nikon's mosaic crop looks more natural where the Canon's looks a bit mottled due to NR processing. The Canon also shows a more defined pattern in the red fabric, though it struggles more at the pink fabric than the Nikon. The Fuji X-T1 is displaying its high ISO performance here, and is definitely able to hang with the "big boys" of the full-frame world. Fine detail from both cameras look very clean, crisp and natural even at ISO 3200. Even on the red fabric, the X-T1 is still able to produce the leaf pattern while the Nikon struggles. The D750, however, produces more detail in the pink fabric. While the K-3 is able to produce a good amount of fine detail at ISO 3200 -- especially in the mosaic crop -- the D750 comes out on top in terms of lower noise, better detail and better handling of the fabric swatches. It's evident here that the A7 has stronger default noise reduction processing. It does well to remove lots of noise, while the D750 shows a subtle film grain-like noise pattern in the shadows. 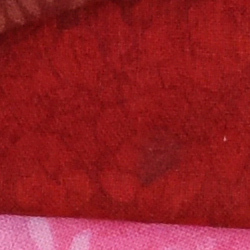 The A7's NR processing, nevertheless, affects fine detail somewhat, particularly in the mosaic and pink fabric, which have taken on a stronger mottled appearance. Detail: Nikon D750 versus Nikon D810, Canon 5D Mark III, Fuji X-T1, Pentax K3 and Sony A7. Detail comparison. High-contrast detail is also important, pushing the camera in different ways, so we like to look at it, too. At base ISO, the Nikon D750, along with the other cameras here, displays sharp, crisp high contrast detail, but as the ISO rises, it's quite clear that the two APS-C cameras are at a disadvantage. The D750 maintains very high image quality at higher ISOs on high contrast details. though the D810 and A7 take top honors in this table. Overview: Excellent prints at 30 x 40 inches and above for all ISOs up to 400; an impressively large 24 x 36 inches at ISO 800; and acceptable prints are viable at all ISOs with ISO 51,200 topping out at 4 x 6 inches. 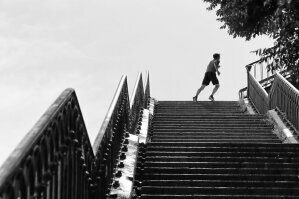 ISO 50/100/200/400 images easily allow for prints at 30 x 40 inches or larger. Despite the range of ISOs here, the prints all look practically indistinguishable and all displaying crisp, sharp detail and excellent colors. ISO 800 prints safely top out at 24 x 36 inches. We saw a very slight drop in fine detail when looking really closely. Prints at 30 x 40 could work in certain situations, especially for wall display. Noise at this ISO is very low, even in the shadow areas. ISO 1600 images look practically identical to ISO 800 shots, only with a subtle increase in some shadow noise, but with the similar excellent level of fine detail and color rendition. Therefore, we’re calling 20 x 30 inch prints the size limit at this ISO, but a 24 x 36 inch print would certainly do for wall display. ISO 3200 prints at sizes larger than 16 x 20 begin to make noise visible. However at 16 x 20 inches, noise is practically imperceptible and the prints at this size display excellent colors and fine detail. ISO 6400 images are slightly noisier, but overall very well-controlled for this ISO level and therefore can make prints up to 13 x 19 quite easily. A 16 x 20 inch print could be usable for less critical applications. ISO 12,800 prints can go as large as 8 x 10 inches easily. Very fine detail is becoming reduced by noise and noise reduction processing. Colors are still vibrant and pleasing, though. ISO 25,600 images are still impressively capable at producing usable prints up to 5 x 7 inches, and perhaps even 8 x 10 inches for less critical applications. Noise and lack of detail prevents anything larger, however. ISO 51,200 prints max out at 4 x 6 inches, which is nonetheless very impressive, as noise itself appears quite well controlled. Fine detail is a bit lacking and "mushy" preventing us from recommending larger prints sizes. The latest full-frame Nikon DSLR certainly does not disappoint in the printing department. All the way up to ISO 400, images from the Nikon D750 are practically noise-free and full of crisp, sharp fine detail and great colors, which allow for prints up to 30 x 40 inches, or higher -- depending on how comfortable you’re willing to push the resolution limits of the 24.3-megapixel sensor. At the mid-range to higher ISOs, prints remain very pleasing to the eye with minimal noise. ISO 800 images can print as large as 24 x 36 inches, and even ISO 6400 files produce a nice 13 x 19 inch print. At the extreme end of the ISO scale, the D750 still manages acceptable prints with a 4 x 6 print at ISO 51,200.